A revolutionary new idea for towels! COTTON USA™ is pleased to partner with SolucellAir and Zero-Twist technologies to help produce long-lasting home textile products that are soft, light weight, and fast drying. Super Absorbent, Yet Quick Drying. Towels and other textile products made with SolucellAir look bulky and substantial, yet are lightweight and feel supremely soft. They are incredibly absorbent, but also quick drying. Best of all, their soft touch lasts and lasts through repeated washings. This patented technology uses air to create a hollow channel inside the cotton yarn. So SolucellAir products are pure and natural U.S. cotton with no chemicals added. Your consumers want products with a low environmental footprint and Solucell, paired with U.S. cotton, provides a great solution. Learn more about SolucellAir at www.solucell.org. Solucell™ and SolucellAir™ are registered trademarkes of BYR international. Solucell is an Oekotex certified product and promotes sustainable productions, enabling to recover and recycle the wastes generated during the manufacturing process. Please note that Cotton Council International (CCI) has no commercial agreement with the companies in this document. Also, CCI does not endorse nor are we able to verify the veracity of the claims or any of the technologies that the companies use. 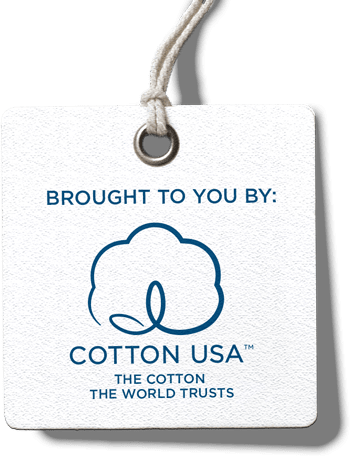 CCI is only working with these companies to showcase potentially interesting technologies that could be used with U.S. cotton for ideas and inspiration only. Any agreement to proceed with one of these companies is solely at your discretion and will not involve anyone from CCI. Thank you. Solucell™ is a patented material that creates an easily dissolvable yarn with enhanced characteristics and a low environmental impact. Their SolucellAir and Zero-Twist technologies help produce home textile products that are soft, light weight, and fast drying. Oritain™. Product Traceability without Labels or Codes. Oritain’s traceability method identifies your product’s origin at any point in the supply chain using advanced forensic science. No packaging labels or additives needed. ZERO-D® - the sustainable answer to AI Fashion! The ZERO-D® solution brings photo-quality print, health and safety in production and for consumers, creates no pollution, but retains cotton’s softness.